Working with Birds of Prey is a unique experience, a chance to see natural survival skills up close. We are fortunate to be able to offer you an experience of a lifetime on one of our Corporate Falconry Events. Join our team of falconers and their birds for an experience of a lifetime. Learn secrets of the age old art of falconry and experience these magnificent creatures close up. Talk to our Falconers and learn the origin of phrases such as “Cadging a Lift,” “Boozing”, and being “Under the Thumb”. Experience the thrill of the flight of the Falcon, the true fighter-pilot of the bird world, who’s agility and speed is breathtaking as she flies to the lure, then end your session with a hands-on session as our trained Harris Hawks fly to your gauntleted fist. Join us for a group session as part of a multi-activity day for an experience that you will never forget. 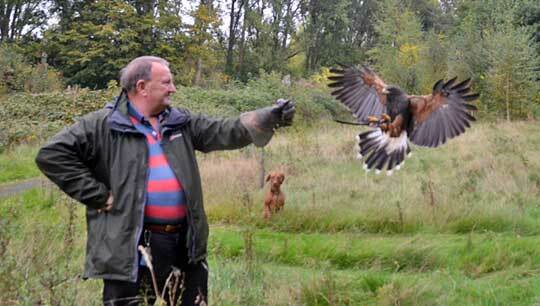 Falconry provides the basis for a Team-Building Event with a difference. Compete to tie the falconers knot, or learn how to use the tracking equipment that each of our birds carries in flight. For something very different, how about a session at the races? Become the trainer/manager of your chosen ferret, and encourage him to run the course and pip your opposition to the winning post. A flutter with a difference. Towards the end of the day, get up close to the birds as Falcons dart above you, or don a Gauntlet and feel the excitement as Hawks fly to your fist for their reward.